BILLY KING is already creating quite an impression in Inverness. 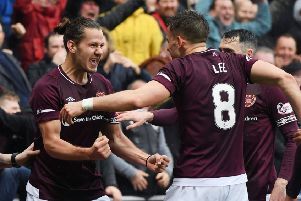 Just three games into his loan from Hearts, fans are chanting the winger’s name after his first Caledonian Thistle goal in Tuesday’s 5-1 Betfred Cup win at Dunfermline. Inverness supporters appreciate the talent they have acquired from Tynecastle. As does new manager Richie Foran, who made three attempts to lure King north before a season-long loan deal was agreed. The player says he is back enjoying himself again. He spent three seasons flitting in and out of the Hearts team, and did likewise on loan at Rangers earlier this year. Privately, he doubts whether there is any future for him at Hearts other than as a bit-part squad player. At 22, he needs more. King is out to ensure his career properly takes off and the Highlands may well be the launchpad. “A few of the young boys have been singing my name so I think they’re pleased to see me here,” he said in an exclusive Evening News interview. “I just want to do my best and score more goals like the other night. It was a deflection but I’ll take it. I want more goals and assists. It is a pleasing change in fortunes for a player who doesn’t seem to fit the mould in Gorgie. “I came back for pre-season training with Hearts and got an inkling that I wasn’t going to be in the plans. I thought I would have but obviously it wasn’t to be,” he explained. “My agent told me Inverness had enquired about me and that Richie Foran really wanted me there. As soon as I found out, I was keen because I knew it would give me game time. That’s the main reason I went. I knew I wasn’t in Hearts’ plans. “I asked Robbie Neilson if I’d be allowed to go on loan. He said: ‘There are a few wingers here. We’ve got you, Sam [Nicholson], [Jamie] Walker, [Dario] Zanatta and Callum Paterson’s been playing right midfield.’ I knew from what he was saying I was going to get limited game time, if that. Robbie said it was entirely up to me whether I want to leave or not. I knew when he said that it was the right thing to go. Asked if he is resigned to a future away from Tynecastle, King replied: “Honestly, I don’t have a clue. I think so. Football changes so quickly so who knows what’s going to happen next year. I’m really not sure. I’m not thinking that far ahead. I’m just concentrating on playing well for Inverness and getting a good season. “I was in and out of the team at Hearts and then went to Rangers and it was more of the same. I got a bit more involved at Rangers but I was cup-tied for the Scottish Cup. I would play a game or two in the league, then there would be a Scottish Cup tie and I couldn’t play. That made it difficult to get a run. Many Hearts fans are at baffled seeing King loaned out again. Their team plays with wingers but this one appears to be disposable. Interestingly, as part of the loan agreement, King will not play against his parent club for Inverness this season. He is at a loss to explain why he hasn’t played more regularly. “Football is based on opinions and the one that matters is the manager’s. I’m not sure at all, I tried my best in training and it just wasn’t to be. I think Inverness is the right move for me so hopefully I can repay the manager’s faith. I’ve really enjoyed it up here so far. Foran’s approach is ideally suited to a pacy, direct winger like King. “He’s got us playing a 4-4-1-1 system with two wingers. We’ve just signed Jake Mulraney from QPR, who is a quick winger.